Stephen Roach of Morgan Stanley says the US economy is headed for Armageddon, according to the Boston Herald. The chance we’ll get through OK: one in 10. Maybe. In a nutshell, Roach’s argument is that America’s record trade deficit means the dollar will keep falling. To keep foreigners buying T-bills and prevent a resulting rise in inflation, Federal Reserve Chairman Alan Greenspan will be forced to raise interest rates further and faster than he wants. Roach echoes similar statements by Paul Krugman this week. To finance its current account deficit with the rest of the world, America has to import $2.6 billion in cash. Every working day. Household debt is at record levels. Twenty years ago the total debt of U.S. households was equal to half the size of the economy. Today the figure is 85 percent.Nearly half of new mortgage borrowing is at flexible interest rates, leaving borrowers much more vulnerable to rate hikes. A source who heard the presentation concluded that a “spectacular wave of bankruptcies” is possible as the dollar slumps against other currencies. Krugman told Reuters that Bush has set “the country on a dangerous course that will likely end in crisis”. The only bright spot in having Bush in power for another four years, said Krugman, is that further economic mismanagement might trigger some sort of popular outcry. “I do believe at some point there is going to be a popular tidal wave against what has happened,” concluded Krugman. “In the meantime, you keep banging on the drum, you keep telling the truth. “And then eventually we have the great demonstrations, which I think are important to let the government know that many Americans are not happy with what is happening,” he said. Microsoft buys Friendster. Google buys Tivo. Google partners with Amazon and becomes — Googlezon. Possible? The end of media as we know it? Participatory journalism driven by bots? A nice Flash presentation with a haunting sound track…watch it here. Did you know that a colour laser printer leaves yellow dots of the serial number and the manufacturing code on every document those machines produce? Scary but true. The dots’ minuscule size, covering less than one-thousandth of the page, along with their color combination of yellow on white, makes them invisible to the naked eye, Crean says. One way to determine if your color laser is applying this tracking process is to shine a blue LED light–say, from a keychain laser flashlight–on your page and use a magnifier. The device that embeds the dots is a chip located “way in the machine, right near the laser” that makes them when the document “is about 20 billionths of a second” from printing. “Standard mischief won’t get you around it,” Crean adds. Neither Crean nor Pagano (Lorelei Pagano, a counterfeiting specialist with the U.S. Secret Service) has an estimate of how many laser printers, copiers, and multifunction devices track documents, but they say that the practice is commonplace among major printer companies. The witch-hunt has begun. And if you are not already aware of it, here are some news flashes to chew on. British authorities with a subpoena supplied by the US FBI shut down 20 Independent Media websites–spanning the continent of Europe and across the ocean to western Massachusetts. The websites were hosted by Rackspace, an Internet Service Provider based in San Antonio, Texas. Volunteer-run Indymedia carries news, articles and other postings about anti-globalization struggles, anti-war protests, and many other issues, including anti-Bush rants. …did he jump or was he pushed? Last night in Washington, the answer was still unclear as the most doveish member of the Bush administration announced he would resign from office whenever his replacement was appointed, probably in January, before the president’s inauguration. …The White House said it would not announce replacements for Powell, Agriculture Secretary Ann Veneman; Energy Secretary Spencer Abraham; and Education Secretary Rod Paige on Monday. Bush won, Kerry conceded, right? So who’s ordering the recounts? Ralph Nader and Bev Harris that’s who. They’ve started http://helpamericarecount.org/ and plan to recount the votes that the politicians don’t seem to care about anymore. Already one discovered computer glitch has changed the fortunes of Democratic candidate Carroll Lanning in Franklin County. Can there be more? Votergate: Was US Elections Rigged? A controversy — on the level of Watergate — is brewing over the possibility of voter tampering of electronic votes cast in the US elections. The crux of the issue is the use of the touch-screen systems manufactured by Diebold Inc which may have been used by as many as one in three voters in November. Bev Harris, the author of Black Box Voting: Ballot Tampering in the 21st Century, asserts that fraud took place in the 2004 election through such electronic voting machines. Harris first drew suspicion about the machines nearly two years ago via a story that appeared, oddly enough, at a relatively unknown site called Scoop based in New Zealand. In August, 2004 she finally got a chance to demonstrate how easy it is to steal an election as a guest on the CNBC program “Topic A With Tina Brown”. Brown was off and Governor Howard Dean subbed as guest host. Harris showed that the central tabulator is – surprise, surprise – a Windows PC, and we all know how secure that is. 4. Simply erase the vote totals completely. In mid-August, Walden W. O’Dell, otherwise known as Wally, the chief executive of Diebold, made the ultimate faux pas when he went on record that he is “committed to helping Ohio deliver its electoral votes to the President” — in a fundraiser letter for the re-election of Bush. In Baker County, for example, with 12,887 registered voters, 69.3% of them Democrats and 24.3% of them Republicans, the vote was only 2,180 for Kerry and 7,738 for Bush. The pattern repeats over and over again – but only in the counties where optical scanners were used. Franklin County, 77.3% registered Democrats, went 58.5% for Bush. Holmes County, 72.7% registered Democrats, went 77.25% for Bush. 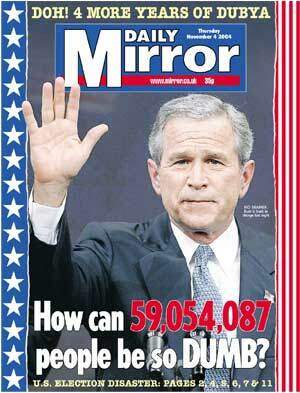 Did all these voters flip for Bush, or was there actual tampering post-election to favour the incumbent? Here is a detailed version of how the Diebold System had flaws that should have been addressed prior to the election. I used to read Bob Bly’s articles in Writer’s Digest with great enthusiasm. It came as a surprise to me that he was so quick to condemn blogging as a marketing tool. Can Blogging Help Market Your Product? I think you are the same columnist in Writer’s Digest whose ideas I used to enjoy reading. But I think you have really missed the boat here on Blogging. The bottomline is “don’t condemn it till you’ve tried it”. I think thousands of people jumped on the bandwagon to build websites and never made a “thin dime” either. There are reasons for that. Just as there are reasons that made some blogs “successful” while others flopped miserably. Blogging is just another tool that has come along. And it has real marketing possibilities. Dig deeper if you haven’t figured this out. I am not overly enthusiastic enough to believe blogging is a panacea for all business ills. But it can work, like many websites have, given the right motivation and understanding of the tool and its ability to ‘engage’ customers in new ways. As a shamefacedly, blatant self-marketeer in all your writings, you more than anyone else should know what blogging can do for your product/service which is mainly to promote Robert Bly. > I don’t condemn it … I just say it is not a proven money maker, and until it is, I’m not going to jump on the bandwagon. > I prefer marketing that had demonstrated an ability to generate rapid, positive, significant ROI. I wonder who was it — oh say about ten years ago — who said the Internet is not a proven money-maker and held back because of that, and now regrets because he didn’t see the ROI. Early adopters never get credited when they actually succeed — only when they fail. There is a lot of wariness when it comes to the Net — and granted some of this is not imagined fear — but where was the “positive, significant ROI” when anyone began using the web? Or started using Yahoo or Amazon or eBay or Google or email to market their business? Or started using websites as a tool to promote or market a service or product? It is early days yet. And blogging is just another tool. To be so quick to say it doesn’t work seems premature. Like websites, it takes discipline, commitment and focus to make a blog work. Just as in any business in the ‘real’ world. Some may have it, some may not. There are no doubt thousands of websites conceived to be the perfect 24/7 marketing tool for companies but are now languishing because someone failed to maintain the site and could not see the longterm “positive, significant ROI”. Blogs aren’t for every company that chooses to be online. But they are here to stay. They are a new means to engage an audience — and therefore a customer base. Didn’t we all have to proactively look for a website before we discovered the ones we liked and could subscribe to? Read about RSS, permalinks, trackbacks, NetNewsWire, SharpReader, Straw, AmphetaDesk, Bloglines, NewsGator, and various other tools that are coming onstream. The add-ins and “blogware” are coming and some are already here. There are even indexes on what is blogged the most like Blogdex, Popdex, and Daypop. And there are bloggers who are committed to posting daily even multiple times on a daily basis. In short, if you start a blog Mr Bly, you would realize how quickly it brings “positive, significant ROI” to you directly and indirectly once it is added to the indexes and blogrolled around the world. As for your writing, I have no doubt it will NOT be “rambling, streams-of-consciousness musings … largely bereft of the practical, pithy tips”. This headline in The Daily Mirror says it all doesn’t it? …They had somehow managed to re-elect the most devious, blinkered and reckless leader ever put before them. The Yellow Rogue of Texas. …America chose a man without morals or vision. An economic incompetent who inherited a $2billion surplus from Clinton, gave it in tax cuts to the rich and turned the US into the world’s largest debtor nation. When I was in New Zealand the one thing that never ceased to amaze me — besides the postcard scenery — was the amount of creativity in such an isolated nation of only 4 million people. Perhaps it is the very isolation or maybe because the fact the sun rises there first that brings out the best in people. The effects in Lord of the Rings is testimony to that. Here’s a gadget I think that would be a hit worldwide — even as debate rages about cellphone jamming — and if the Chinese don’t rip it off sooner than you can say CellTrac-r.
Cellphones use two kinds of electromagnetic radio frequency signals to operate. Low radio frequency indicates that the cell phone is in standby while high frequency indicates that the cell phone is receiving calls or text messages. CellTrac-r is an Electromagnetic Transient Anomaly Detector and only reveals the location of high radio frequency cellphones. 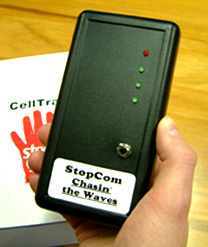 When a cellphone in operation is detected, the location is revealed by four lights on the CellTrac-r panel. If all four light up, the cell phone is near. If one lights up, the cell phone is about 98 feet away. What’s exciting about the CellTrac-r is that it has already found its niche. Two students were caught using cellphones in end-of-year exams recently, reports the New Zealand Herald. The device picked up incoming and outgoing calls and text messages. You can see the possibilities. The CellTrac-r was invented by six secondary school students at St Thomas of Canterbury College in Christchurch. The teenagers did it as part of 2004 Canterbury Young Enterprise competition at school and have now created their own company, Stopcom, and sold every model they made. Unfortunately, according to their website, Stopcom is no longer taking orders for the device and is not seeking investors – I wonder why. But the company and all its assets are up for sale. “Kathmandu, November 3: Notorious serial killer Charles Sobhraj, who is serving life sentence in a Kathmandu jail, has made an attempt to escape, but police on Wednesday claimed to have foiled it by unearthing an e-mail sent from his laptop asking a friend to help drug prison guards. “Authorities seized a laptop, a mobile phone and a cordless phone from the prison cell of Sobhraj, known as “The Serpent”, and discovered the mail asking for some specific chemicals to drug the prison guards, spokesman of the Nepal police Ramesh Singh said. “The criminal, known for his talent for disguise and escape, has given a list of chemicals that can make people unconscious and sought arrangements for taking him to India and then to France, a police official said. This brings me to my point. Why does Sobhraj, a known con man, jewel thief, drug dealer and murderer who has escaped from prison before been given a laptop, Internet access, a cordless phone and -if I can be excused – a cellphone? Perhaps he was finalizing the script to his movie. To me, a prison with Internet access and wireless communication is home. That reminds me. I need to get out more.